Actress, comedian, and Hollywood High alumnus Carol Burnett was bestowed with the very first Carol Burnett Honor of Distinction Award at the El Capitan Theater. Enter the scene: blinding lights, the shutter of cameras, and a red carpet for contenders of the entertainment industry and PAM students alike to walk upon. This was the first annual Hooray for Hollywood High event, which honors former students of Hollywood High and current students in the Performing Arts Magnet program. In addition to Burnett, other celebrities attended that evening: Rita Moreno, Benito Martinez, Leeza Gibbons, Shirley Jones and Marty Ingles, Sally Kellerman, and Charlene Tilton were among the many. The PAM students performed several dynamic skits from their productions over the years like Chicago, Rent, Beauty and the Beast, and Moulin Rouge, with some past students from the program to reprise their roles, like Max Herrera (2012), Shayanne Ortiz (2012), Kacey Baughan (2011), and Daniel Cruz (2011). 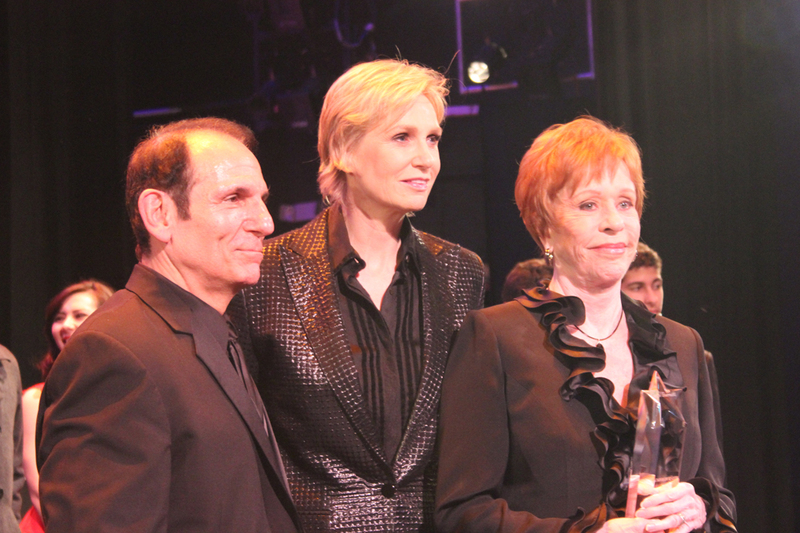 At the closing of the ceremony, surprise guest Jane Lynch presented Burnett with a speech and the first ever Carol Burnett Honor of Distinction Award, an award which will now be presented to future notable Hollywood High alumni. Carol Burnett, who was once an editor in chief for Hollywood High School’s newspaper, starred in several film, television, and Broadway performances such as Annie, Once Upon a Mattress, The Ed Sullivan Show, The Garry Moore Show, 6 Rms Riv Vu, The Four Seasons, Pete ‘N Tillie, and her very own show, The Carol Burnett Show, an Emmy Award-winning comedy series that ran for twelve years. This event, created by H2O coordinator Stormy Sacks and the Friends of Hollywood High School Performing Arts Center, was also a major fundraiser to keep the PAM program alive and kicking, a rebuttal to the major budget cuts LAUSD has faced in recent years. “It was very amazing, and it was an honor meeting Carol and Jane along with other Hollywood stars. It was a very memorable experience that I hope to do again next year,” said Tiffany Amber Jimeriez, a PAM senior.